Vernon and Slauson are the next Metro Blue Line stations slated for upgrade work. This weekend and the next, from Friday at 9 p.m. through Sunday, close of service, the stations will be closed as crews install new canopies, paint, tile and audio/visual enhancements. 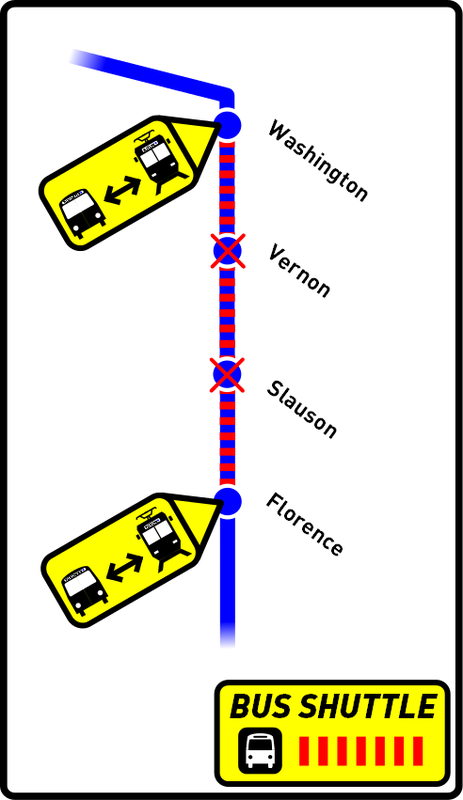 While work occurs, bus shuttles will replace Blue Line trains between Washington and Florence stations. Before we launch into the details of this weekend’s Blue Line rail and bus shuttle service, we’re excited to say that the end of the station refurbishment component of the Upgrades Project is in sight! As we’ve mentioned, work will take place at Vernon and Slauson stations over the next two weekends, before taking a break for 4th of July weekend. After that, the plan is for the last full, weekend-long closures to take place July 10 through 12 and 17 through 19. Now, one thing to keep in mind is that even though we’ll be saying “good riddance” to full weekend closures of Blue Line stations in mid-July, weeknight maintenance will continue in order for workers to fully wrap up some track work. Moving on to what you can expect while station closures/bus shuttles are in effect. After 9 p.m. this Friday, southbound Blue Line trains will return north to 7th Street/Metro Center at Washington, and trains originating in Downtown Long Beach Station will travel only as far north as Florence. Customers wishing to travel between Washington and Florence will need to board Metro bus shuttles (marked as “Blue Line Shuttle”) in order to do so, and should allow extra time to complete their trip. Shuttles will serve Washington, Vernon, Slauson and Florence stations at a frequency consistent with Blue Line rail service levels. Friday, June 19, after 9 p.m., Blue Line will run every 12 minutes between Downtown Long Beach and Florence, as well as between 7th Street/Metro Center and Washington. Expo Line trains will also depart every 12 minutes. Saturday June 20 and Sunday June 21, Blue and Expo Line trains will continue to operate every 12 minutes throughout the service day. Over this weekend, Nextrip should accurately display revised Blue and Expo Line arrival times. We suggest customers make use of this service in lieu of Trip Planner or station timetables, which will not reflect the maintenance schedule. On behalf of Metro, thank you to everyone affected by the work this weekend for understanding. The end goal to keep in mind is a safer, more reliable and updated Metro Blue Line for years to come. Please check back here at The Source, or follow us @metrolosangeles or@metrolaalerts for the latest Blue Line service updates. Yes, Pico Station is also on the schedule for upgrade work expected in July.